Bonnie Dickerson knows she can always count on her friend, Gil Sans. At 88 years old, Gil is reliable and timeless. Only a hand-lettering chalk artist could have such a personal relationship with fonts, and Bonnie is exactly that. She lives and works in Jackson, Mississippi, finding inspiration in old books and old signage and making up new fonts as she needs. Some of her work can be seen displayed on the menu boards at Fondren Public, Saltine Oyster Bar, The Manship, and Feathered Cow; on the cover of Mississippi Magazine’s 2014 Unwrapped Gift Guide; and, most recently, at the 4th Annual Backyard BBQ Invitational in Fondren. Bonnie approaches each piece as a way to express more than just what the letters in the chalked words spell. By the time she reached Gulfport High School, she was enrolled in private art classes and was receiving encouragement from her art teacher and mentor, Joyce King, to enter competitions and portfolio reviews. Her hard work earned her an art scholarship to Mississippi State University, where she graduated with a degree in graphic design in 2004. But, it was a continuing-education class in calligraphy offered by Millsaps College years after Bonnie had moved to Jackson that would spark her work with hand-lettering. 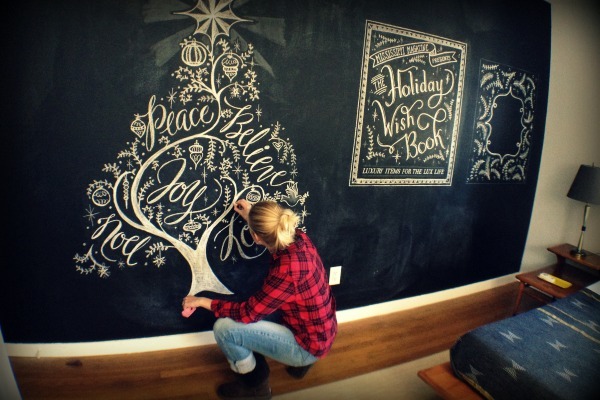 Today, chalk girl has an entire wall of her bedroom acting as a ceiling-to-floor chalkboard, and she fills the space with design after design as she draws and creates then erases and starts the process all over again. She readily admits that the art form of font design and hand-lettering is trending right now and may not be around for long. She also is not remotely bothered by the fleeting nature of the medium. The impermanence of what she creates is actually what she loves most about her dust-covered masterpieces. They make a difference in the world, if only for a short time. And, really, isn’t that the way most wonderful things are in life? Love the work😃 love the medium😊 loved reading about the artist, too. Thanks Sunnyhuckle.com!